This contemporary oasis has stunning breathtaking water views, a sleek design, flawless floorplan and is situated on the 23th floor of a landmark building considered a contemporary work of art! 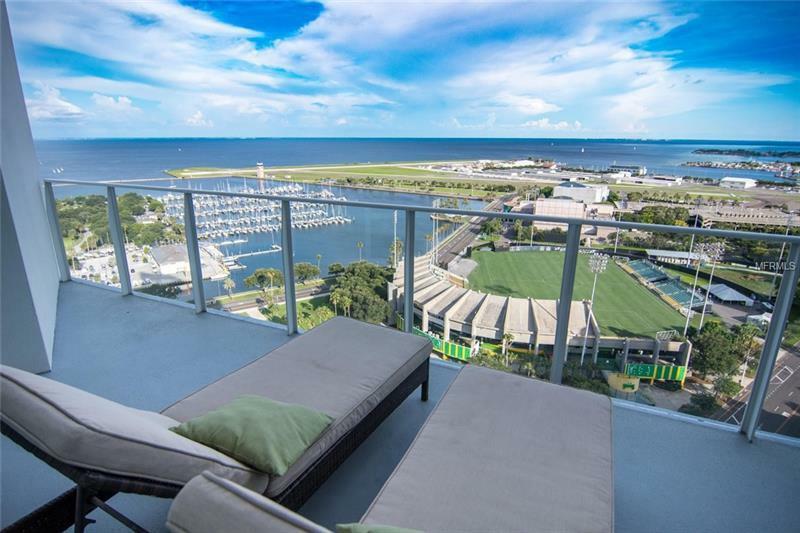 This two story condo home comprises of 2 bedrooms plus den, 2.5 bathrooms, 1996 square feet of interior living space, floor to ceiling windows offering unobstructed panoramic views of Tampa Bay, Downtown St. Petersburg, and the Sunshine Skyway Bridge. Designer kitchen featuring European cabinets, stainless steel appliances, quartz countertops and flat top range looking out onto the spacious living room and main floor balcony. Enjoy the 3 separate balconies that total over 500+ square feet of outdoor living space with south and southeast views! Signature Place is located in the heart of downtown St. Petersburg and is one of the most iconic condo buildings in downtown St. Pete known for its modern architectural appeal. Amenities include, Spacious state of the art Fitness center, 24 hour concierge, large heated pool, private cabanas, Spa, Two Out door grills, 2 club house rooms, and putting green. Walk to all your favorite restaurants, museums, art galleries, Beach Drive, Bay front parks, Vinoy, concerts in the park, and much more. This is the most sought after downtown living residence. Pet friendly. Pet Restrictions: 2 Pets per unit, tenants are not permitted to have pets.